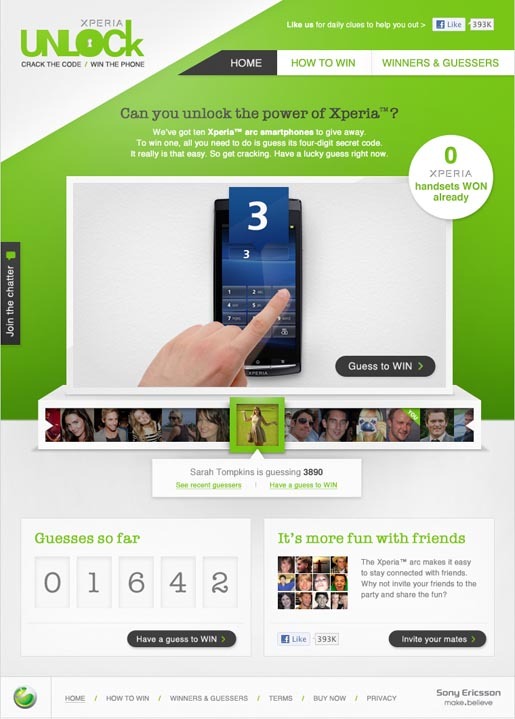 Sony Ericsson has launched Unlock Xperia, a Facebook app that invites Australians to guess a four-digit unlock code to win a Sony Ericsson Xperia arc smartphone. Fans enter their code. They then watch the ‘hand of destiny’ enter their guesses into the handset. If the code is the correct one, they win the phone. It’s that simple. Since the app’s launch, thousands of guesses have been made with the first handset already cracked and won. There are nine more Xperia arc smartphones still to win, with one released every four days, or until some lucky punter cracks the code. The Unlock Xperia app was developed at Iris Nation, Sydney, by creative director Tom Hoskins, digital lead/art director James Griffiths, copywriter Isabella Hiew, and account director Jarrod Brennan.